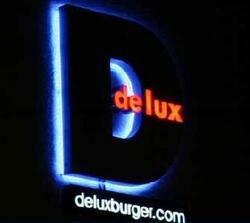 I recently had the opportunity to hit Delux Burger, a burger joint on Camelback in Scottsdale. Upon arrival I could tell that I was definitely in a Scottsdale burger joint. After perusing the menu I decided upon their signature burger, The Delux. This burger is no regular burger as one might expect. 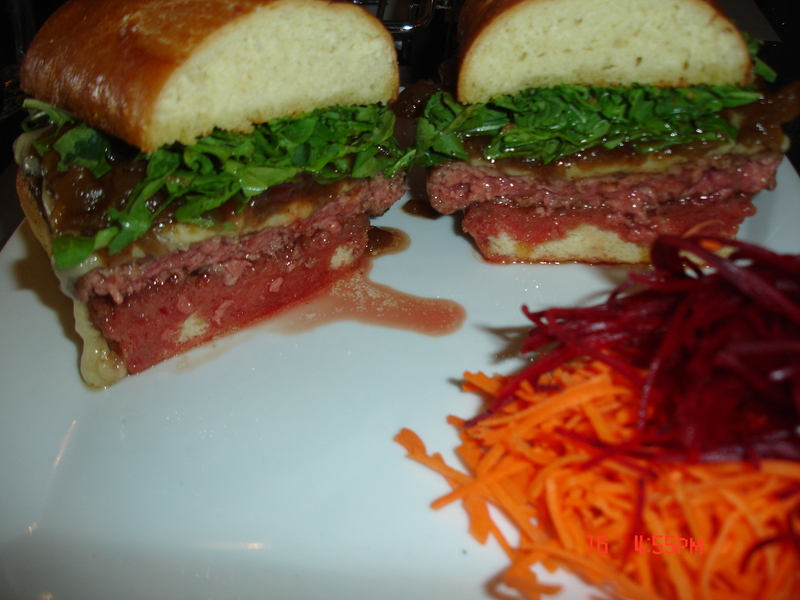 Delux uses their own premium ground Niman Ranch USDA Choice beef and hand forms their patties on a daily basis. It is topped with Maytag Blue and Gruyere cheeses along with arugula, carmelized onions and applewood bacon and served on a locally made lightly toasted mini-baguette. The thing I appreciated most was their recommended preparation of medium rare which I happily obliged. I also ordered a half and half batch of their shoestring style french fries and sweet potatoe fries which was served with ketchup and their house aioli. Lastly I ordered from their wide selection of beers both on draft and in bottle. I opted for their seasonal Four Peaks brewed Orange Blossom Ale. I enjoyed it initially however, found it to get a bit sweet, almost like having an orange creamsicle. I found the service to be excellent and very responsive. The burger was perfectly prepared medium rare (probably not for everybody, but should be). All of the ingredients worked perfectly together, especially the arugula. 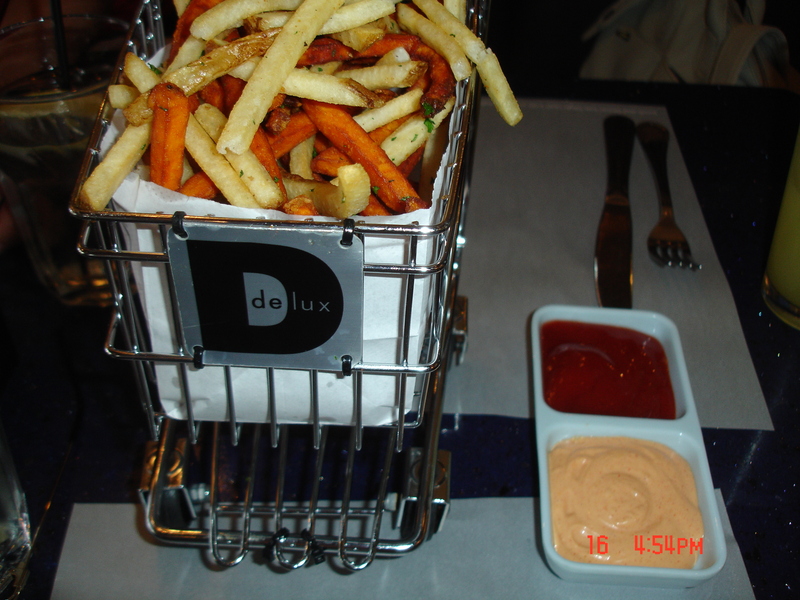 The fries were golden brown and crispy and worked great along side the burger appropriately named Delux. This place is great and I strongly suggest you see for yourself. 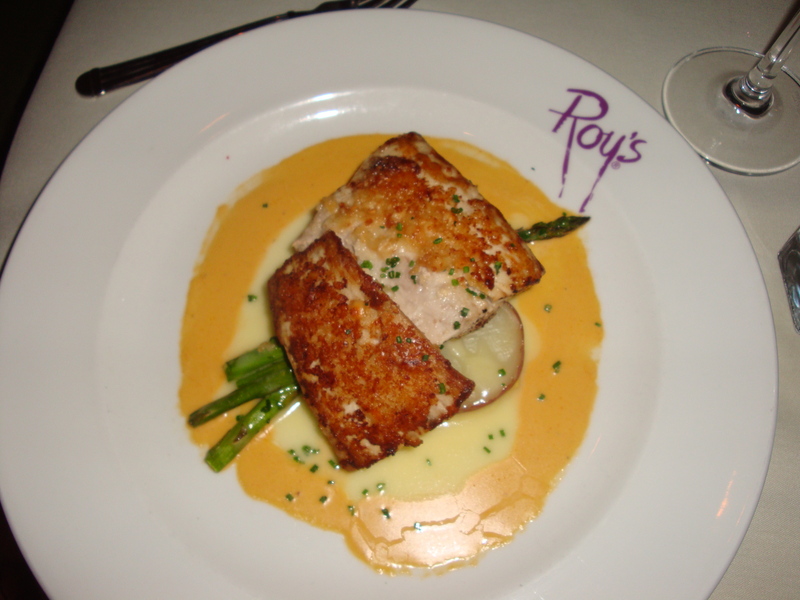 Tonight we went to Roy’s at their Desert Ridge location inside the JW Marriott resort. The Executive Chef there is Mako Segawa, my wife’s father’s brother and the guy is top notch! The level of detail that the restaurant executed was truly impressive. The entire experience, from the staff’s service to the quality of product, could not have been any better. There were four of us dining and we started with an appetizer called Roy’s Canoe for Two; Grilled Szechuan Pork Ribs, Blackened Ahi, Seared Tiger Shrimp, Lobster Potstickers and a Panko Spicy Tuna Roll. Every item was excellent, especially the ribs. There were four of us and each person wisely chose fish as their entree. 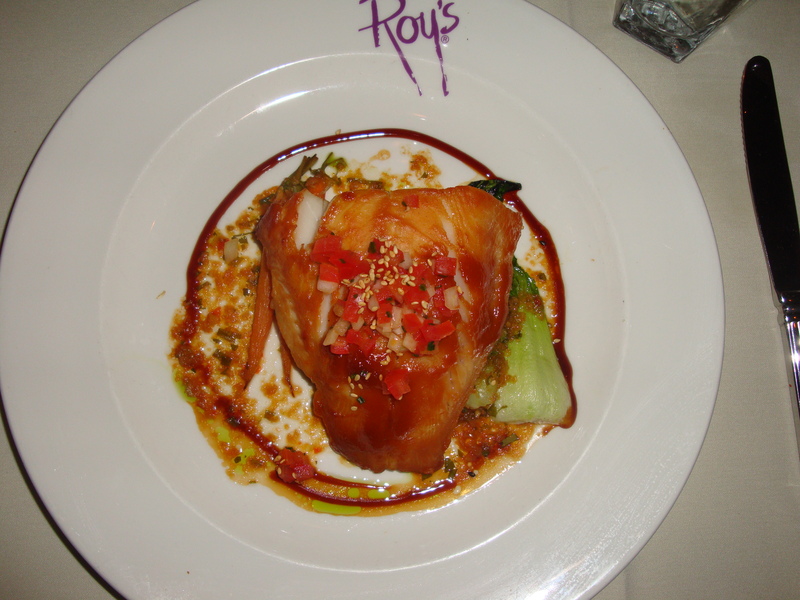 I had Roy’s Trio featuring three samplings of fish; Hibachi Salmon, Blackened Ahi and the magnificent Misoyaki Butterfish. I couldn’t have been more pleased with how well each fish was prepared, medium rare to rare, perfectly paired with a complimentary sauce. 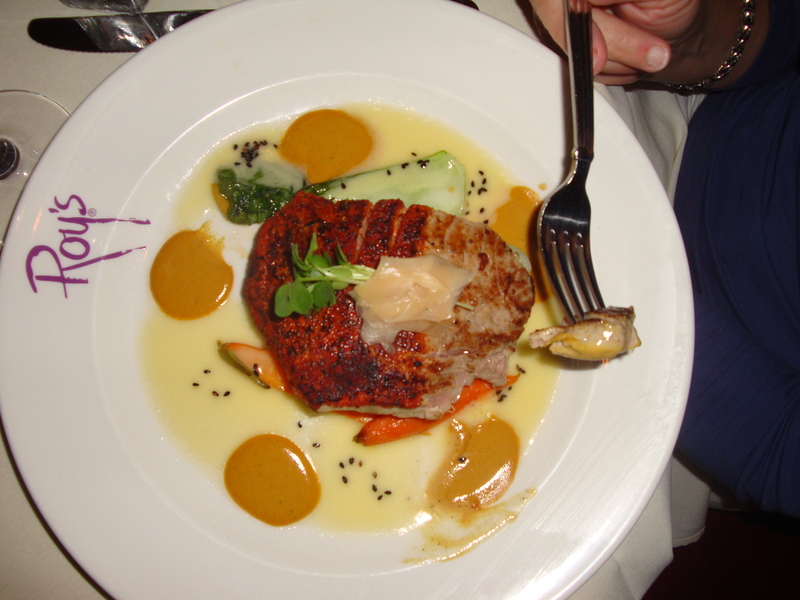 My wife ordered the Macadamia Nut Crusted Mahi Mahi with a Lobster Butter Sauce. 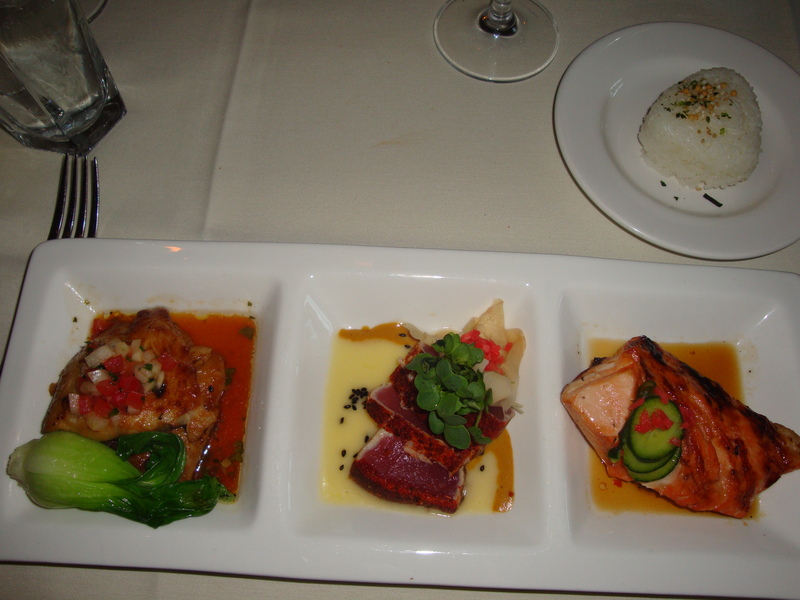 The two that we dined with ordered the Blackened Island Ahi with a Soy Mustard Butter Sauce and the decadent Hawaiian Style Misoyaki Butterfish (aka Black Cod) with a Soy Vinaigrette. Needless to say everyone was equally satisfied with their meals and we finished with two deserts; The Roy’s Famous Chocolate Souffle with Raspberry Coulis and their Pineapple Upside Down Cake. Perfecto! Mahalo Mako for the wonderful experience! Thanks for the clarification…never above a geography lesson. Did you enjoy the burger? Digging on the grind as well.